We all have our favorite hairspray for varying reasons, and sometimes its hard to find that perfect blend in a travel-friendly can or bottle. 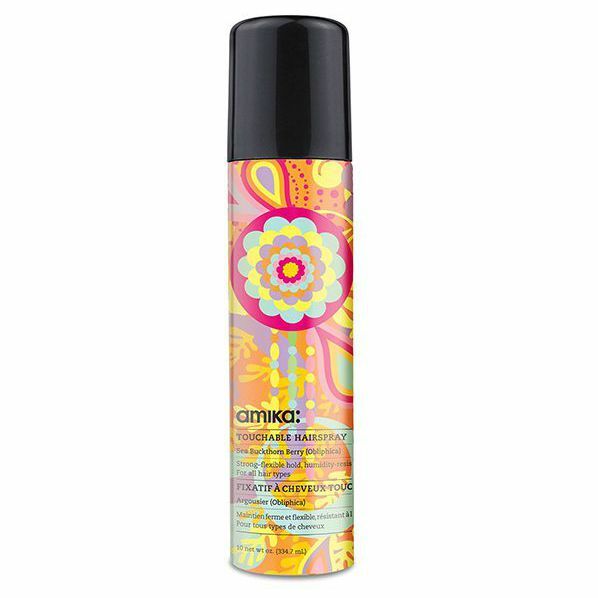 Enter Amika's Touchable Hairspray: For just $10, you can rest assured your vacation style will stay all day long without feeling crunchy or looking frozen in place. This spray toner is the perfect way to hydrate when you're en route anywhere. Either spritz clean skin on the plane or freshen up foundation throughout the day. Chances are when you think hand creams, L'Occitane instantly comes to mind. Known for its chic packaging and enticing scents, they're a sure travel staple. This particular blend is infused with soothing lavender and intensely hydrates even the most dry, chapped hands. Fancy toothpaste may seem like an unnecessary necessity, but once you brush with Marvis, you'll understand its purpose. One use and you'll forget that you're getting ready in a random hotel bathroom away from home. If you thought the toothpaste was chic, wait until you see this mini Away suitcase with accompanying "essentials": toothpaste, toothbrush, This Works pillow spray, Malin + Goetz grapefruit face cleanser and Vitamin E moisturizer, and, should you need it, a Wallpaper City Guide to London. It's as adorable and it is functional: only problem is it's currently sold out, so join the mailing list to be among the first to know when it's available. Yes, it's pricey, but you'll swear your hair was touched by an angel after using a Mason Pearson brush. The specially crafted bristles distribute natural oils from the root throughout the hair and minimize static and frizz. And with this cute pocket-size offering, you can maintain your mane on the go. Depending on where you're traveling, the weather may not be conducive to voluminous hair, so fake it with Byrdie HQ's favorite texturizer in a handy mini can. This toothbrush may not be travel size, but it's the perfect setup for a jet-setter. The accompanying stand doubles as a protective case that you can flip the brush head upside down into to keep it clean and sanitary. Plus, it vibrates for a deep clean (and is even timed so you brush for the optimal length). A personal favorite of this editor's, this creamy cleanser removes every inch of makeup, including stubborn mascara, while leaving your skin feeling soft and hydrated—no tightness whatsoever. This genius travel razor comes equipped with a spray bottle and shea moisturizing bar so you can shave literally anywhere—in the backseat of a car, the plane, anywhere. It's so frustrating to have chipped nails and no remover in sight, but these solution-soaked pads make carrying around liquid remover incredibly easy so you can wipe and go without any mess. What are your travel essentials? Tell us below!